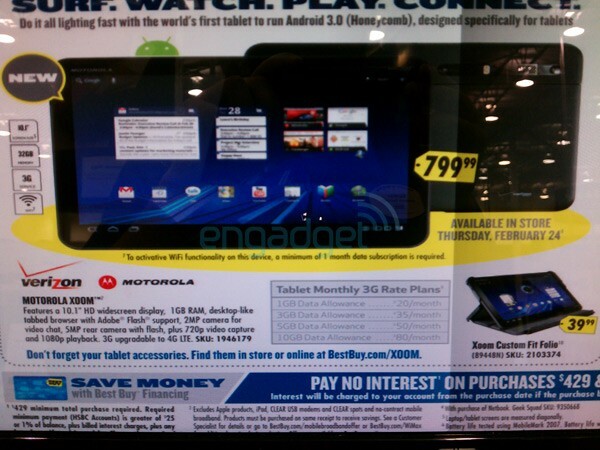 News broke yesterday after the Motorola XOOM Super Bowl ad aired that the device would come to Best Buy at a price of $799 and people started freaking. Let me just say that you’ve all known the price was going to be $799 for weeks now and that’s not the full story here. We can debate all day on whether or not that price is too high, but what really has people up in arms is the little note under the picture of the XOOM that reads “To activative WiFi functionality on this device, a minimum of 1 month data subscription is required.” And yes, it actually says “activative” instead of activate. So what that means, is in order to buy a Motorola XOOM from Best Buy and presumably Verizon, you will have to pay for at least 1 month of their 3G tablet data plans which start at $20 per month. Now, before you throw something at your screen, understand that they do the exact same thing with the iPad, only they make you take a MiFi unit with you. While $20 doesn’t completely anger me, it just comes off a little greedy. OK, more than a little. We’ll be digging for more, but as of now, this supposed Best Buy ad with numerous grammatical errors is what we have to go on. Update: As our buddy @richie681 points out, that line about it requiring a plan to unlock WiFi, could easily be another error and should have been replaced with “3G.” Makes a lot more sense and is not out of the realm of possibility especially after seeing the other half-dozen mistakes on this sheet. But again, Verizon does require a MiFi bundle with the iPad. Android 2.4 is Also Gingerbread, Ice Cream Sandwich to be 3.1?